The Skywater Group See's Increased Demand for the Trade and Exchange of Luxury Assets: Yachts, Jets & Real Estate through Skywater Exchange. Fort Lauderdale FL. USA. The Skywater Group, consisting of Skywater Yachts, Skywater Jets and Skywater Estates sees increased demand for their Trading and Exchange Platform - Skywater Exchange. 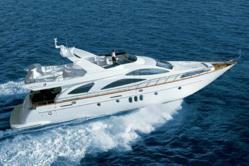 80 Azimut motor yacht trade for mid size jet up to $2 million. "the number of people who are interested in luxury asset trades - yachts, jets, real estate is amazing"
“It is quite amazing at the number of people who have interest in this platform” states Larry Morales, founder of the Group and President of Skywater Jets. “We are getting calls from not only Principle owners, such as the call I received last week from an owner who owns several large pieces of real estate in Beverly Hills, priced from $7 million to over $40 million, who is looking to trade for a 100’+ yacht, but also from agents, such as the yacht broker who has a client with an 85' Ocean Alexander motor yacht looking to trade for real estate”. Recent requests include an 80' Azimut motor yacht owner looking to trade for a jet, an owner with various large tracts of land and a couple of islands in Belize, Central America, looking to trade for jets or yachts and an owner of a 118' motoryacht looking for real estate in USA.